Remains of Tiffany Morrison ID’d – WHO KILLED THERESA? Human remains found in an aboriginal community south of Montreal on Tuesday have been identified as those of a woman missing since 2006. The bones have been identified as those of Tiffany Morrison, 25, from the Kahnawake reserve, officials with the local police force confirmed on Friday. The remains were found by a construction worker in a wooded area near the Mercier Bridge, which links Montreal to the South Shore region, said Warren White, an investigator with the Kahnawake Mohawk Peacekeepers. The bones had been covered with some branches, White said. 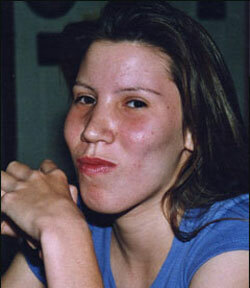 Morrison was reportedly last seen in a taxi with a man on the Kahnawake reserve, southwest of Montreal, on June 18, 2006. Morrison’s family had been critical of what it said was a lack of media coverage of her disappearance. Tiffany Morrison went missing the day after the June 17th, 2006 search party for ‘Who Killed Theresa?’ I remember hearing something on the news then, but nothing since. When I saw the news earlier this week about remains being found and that they were possibly of Tiffany Morrison, I sent you the link, thinking that she was one of the girls listed on your Missing Quebec Women map. What struck me about the newsclip though, was the shot of a bulletin board with the pictures of approx. 20-30 other missing Native women. I knew Tiffany. We went to high school together. I moved to Toronto and lost touch. When I first heard this in 2006 I was shocked and knew she wouldn’t leave her daughter. No way. I can’t believe this happened to her and her familly. I think of her daughter, the same age as mine, and my heart breaks. Someone out there is responsible for this, walking around. I want someone to be brought to justice. This is ridiculous that they only JUST found her. What were the police doing? They failed her. They should be held accountable. If they had of had a walking search they would have found her sooner. There would have been untouched evidence. UNNACEPTABLE. The stories of so many missing first nation’s women go untold or barely make the front pages. This is a problem all across Canada.